At the heart of the PowerShot G5 X camera is a brilliant 1.0-inch 20.2 Megapixel* High-Sensitivity CMOS sensor. Physically larger than the sensors found in most compact cameras, the PowerShot G5 X’s sensor works in tandem with Canon’s DIGIC 6 Image Processor to quickly deliver gorgeous, high-resolution images with nuanced details, plus impressive low-light performance with a low signal-to-noise ratio and minimal noise and distortion. Suitable for tremendous enlargements, significant cropping and many other applications appealing to the advanced photographer, images and video captured on the PowerShot G5 X’s sensor are engineered to impress even the most critical eye. To take advantage of its large, 1.0-inch imaging sensor, the PowerShot G5 X camera has a sharp and versatile 4.2x Optical Zoom lens. With a 35mm equivalent range of 24–100mm it’s equally suitable for landscapes, portraits, group photographs and even close-up photography. Designed to perform in numerous lighting situations, the PowerShot G5 X’s lens has a bright maximum aperture of f/1.8 for low light performance, a 9-blade aperture for beautiful, blurred background detail and is engineered to focus from distances as close as 2.0 in. The PowerShot G5 X’s lens works in concert with the camera’s sensor and image processor to reliably deliver sharp images from edge to edge and from wide-angle to telephoto, all tailored to meet the exacting standards of even critical photographers. The PowerShot G5 X camera’s defining feature is its unique, high-definition electronic viewfinder. It’s great for photographers who prefer to hold the camera up to their eye, and is a veritable lifesaver in bright light and when composing on the camera’s LCD screen is inconvenient or overly conspicuous. Featuring 2.36 million dots, and with a wide color gamut, it provides a high-contrast, realistic and smooth edge-to-edge view for image composition, adjustment and review. Designed for sustained use, it delivers 100% image coverage, a smooth refresh rate up to 120 frames-per-second (Smooth Mode) and a flexible information display that can enable comfortable camera operation throughout the day. 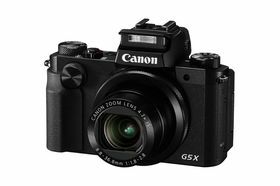 Its 22mm eyepoint delivers excellent visibility, even when wearing glasses, and a built-in eye sensor helps the PowerShot G5 X to transfer quickly between the viewfinder display and Live View on the camera’s LCD. Designed for speedy operation while looking through the viewfinder, the PowerShot G5 X camera features a host of controls for quick, accurate settings and adjustments. Beyond its Vari-angle touch panel LCD monitor, the PowerShot G5 X features a front dial situated on the front of the camera for operation with the index finger, a top-mounted, thumb-operated exposure compensation dial, a rear-mounted control dial plus a control ring around the camera’s lens. Eminently customizable, each dial has an optimized operating torque that helps to identify it by feel, for sustained, intuitive and near-silent operation in quiet situations like weddings and performances. The PowerShot G5 X camera’s hot shoe enables expanded operations for advanced photography. It’s compatible with all Speedlite flashes for the EOS System, so bounce flash and multiple-flash photography is easy to achieve. Whether attaching a Speedlite flash or the Remote Switch RS-60E3 for long exposures or night scenes, the PowerShot G5 X’s hot shoe can help provide shooting opportunities far beyond the scope of most compact cameras.